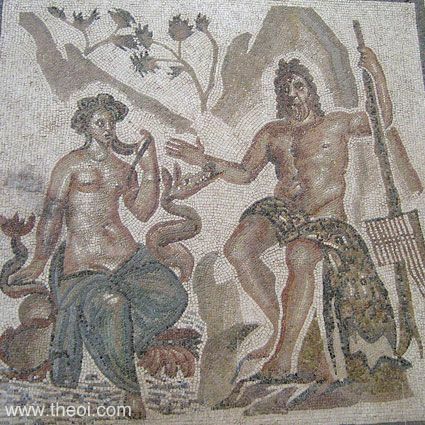 The Cyclops Polyphemus woos the Nereid Galatea. The giant is depicted as a stocky man with a third eye set in the middle of his forehead. He wears an animal-hide drape and holds a tree-branch hung with a set of panpipes in his right hand. The nymph Galatea is clothed in a blue-grey robe and rides a draconic sea-serpent.